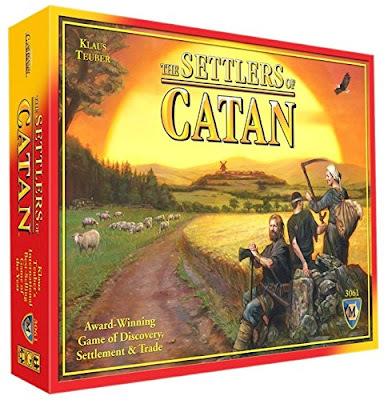 So... who won the Catan game? What happened on days 3 and 4 (and 5 and 6, for that matter)? WHY IN THE WORLD WOULD YOU LEAVE US IN SUSPENSE LIKE THAT, RUSTY?! 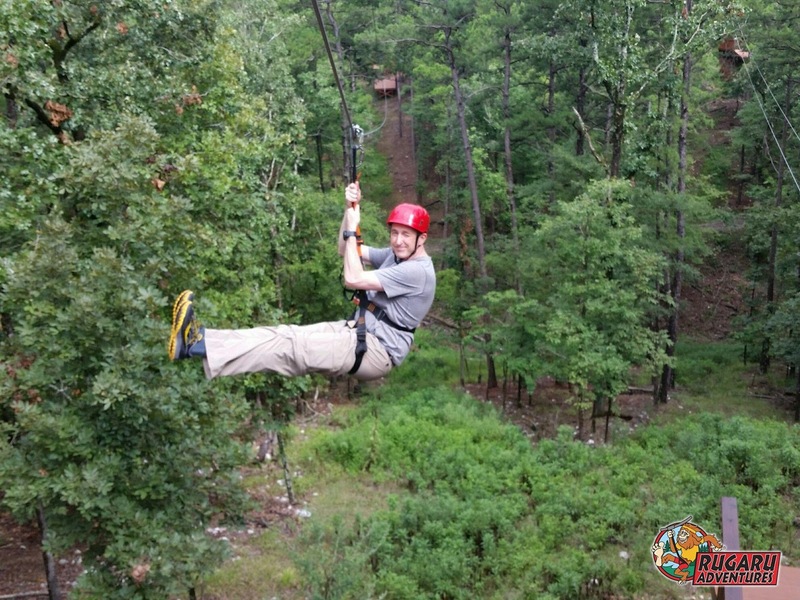 Our planned activity for Day 3 was zip-lining. Unfortunately, Mother Nature made other plans. We were scheduled to go before mid-morning, but we woke up to thunderstorms. 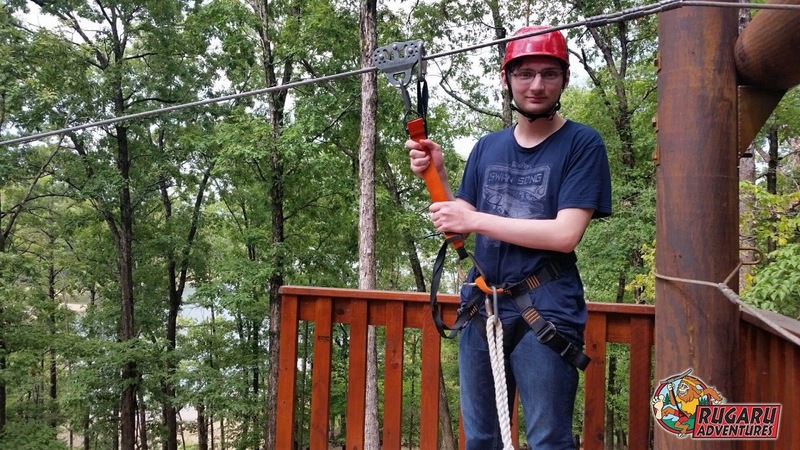 I called the zip-lining company, and they had decided to not even send crews out to check the lines and that all morning sessions were cancelled. We were bummed, but then remembered that we had a game of Catan waiting for us! Do you want Wood for your Sheep? The good news is that the rain had cleared off enough to consider the zip-line again. I called the place, and they were indeed open and had a spot for the four of us. We went up there after lunch for zip-lining greatness! 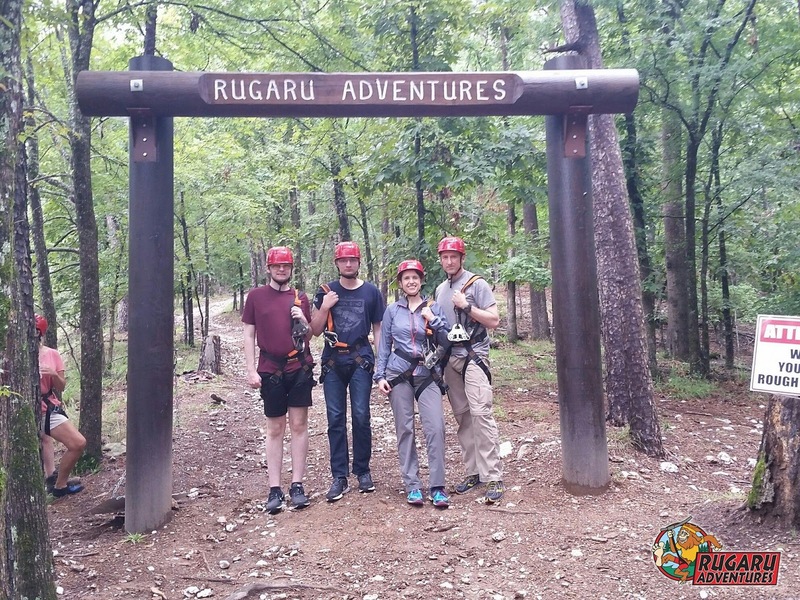 The adventure was courtesy of Rugaru Adventures, and the guides were all fun. We went with another family of three and a single adventurer, so our party was decently sized. Proof we all went outside! 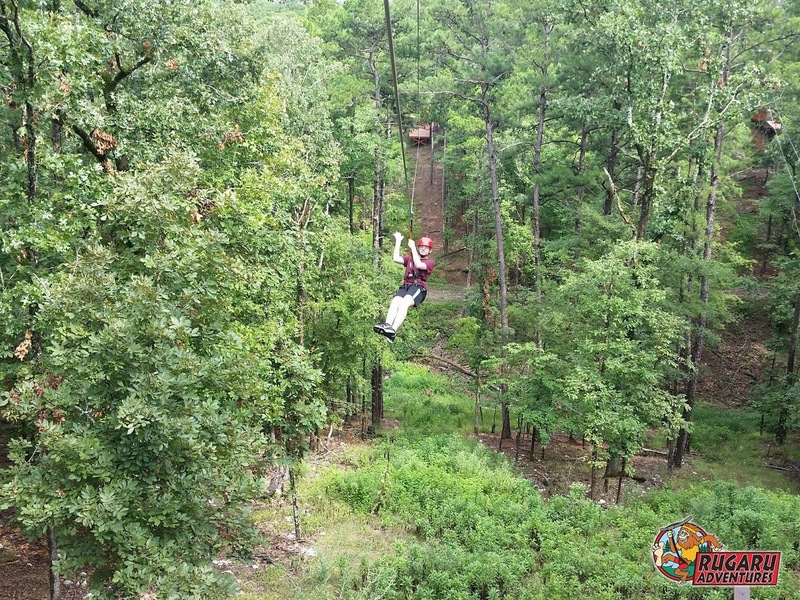 The course had six zip lines to go through, and we kept a brisk pace (as the weather was still somewhat threatening). 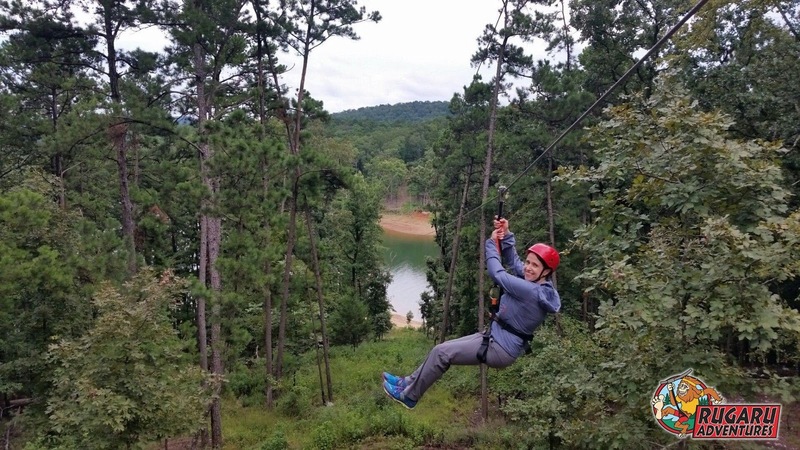 I had never been zip-lining in any form or fashion, although everyone else had. Noob! I think it's safe to say that the entire group enjoyed the adventure. Some of the views from the lines were pretty impressive, especially the one that takes you out over the lake. Oh, you say you'd like a picture of that? Don't worry -- Rusty will provide! Does the line dump you into the lake?! And yes, Tanya smiled the whole time. I think she was still glowing from the recent conquest of Catan. Not to be outdone, Gabriel got a wave in to the camera while on one of the lines. Even Garrett enjoyed himself. He typically doesn't smile for pictures, but I don't think he could help himself. That's not a smile, Dad -- it's a smirk! But honestly, do any of you think I would not claim the silliest picture pose? Hey, I may not be very good at board games, but I know how to ham! And then there's the group pose. We could take a serious picture, but why?! I'm really glad we got the chance to do this. 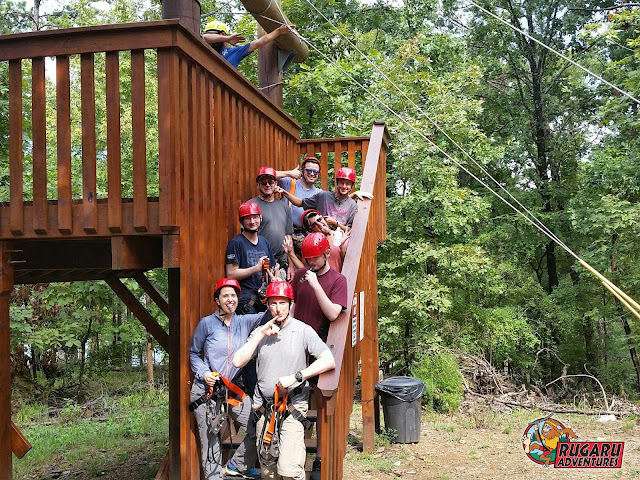 The operation is well-run, fun, and definitely worth doing if you're ever in the area. All that zipping around left us hungry. We decided to abandon all pretense of finding food that was somewhat good for us and went to The Blue Rooster. There's also a blue metallic rooster in the yard. 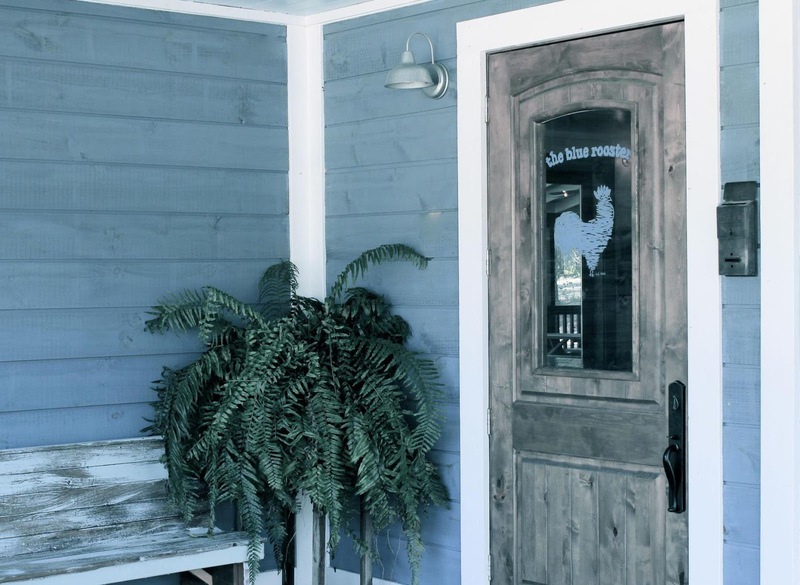 The Blue Rooster specializes in fried food. This is where the wheels came completely off of my vacation sensible eating plan. We loved this place. We loved it so much, we went back again the next night. So much tasty-fried goodness! They even had fried pies for dessert! The first night, I had the lemon fried pie. The second night, it was apple (of course).